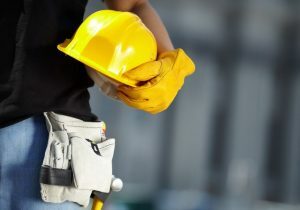 Do You Need a Construction Site Cleanup? We Cleanup Your Construction Zone. When construction is going on, there are always a lot of things to worry about. If construction is done on your home, you can end up with things like shingle roofing damage and it will have to be redone or cleaned up. Construction crews leave debris and old parts laying around all over. These items will need to be taken away for the place to be presentable. There are many ways that a construction cleanup company can help you make sure that your construction zone is cleaned up to your satisfaction every single time. Here are a few reasons you may want to hire a construction cleanup crew. Pressure Washing – Construction sites get messy almost everyday workers are on the job. When this process is all over, you will want a nice pressure washing done. This will help to clean off all of the caked on dirt and debris that have gathered through the construction process. 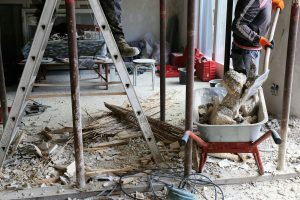 Removal – When construction is being done and when it is all over, there is often a lot of trash left around and large items that will need hauling away. Sometimes it can be hard to know where to take your trash, but we can haul it away for you. Finished – Once a project is done, you may want to have it coated to keep it from getting damaged in the future. There are coatings and seals that can be applied to the new work you have done. If you need construction cleanup in Waco and Temple, TX, call eSquared Asphalt Maintenance at 254-716-8685. Posted in Uncategorized on March 29, 2019 at 8:28 am by eSquared Asphalt Maintenance. Paint or Coating: Which is Best for Your Garage Floor? As a homeowner, you have probably heard about epoxy, silicone, and acrylic garage floor coatings. Chances are, your neighbor or good friend has recently had a coating applied and has told anyone that will listen about the unbeatable benefits of these innovative coatings. But are coatings really that much more beneficial than traditional garage floor paint? Garage Coatings Offer Superior Protection, While Paints Deliver Affordable Prices. The fact is, your neighbor is right. Garage floor coatings come chalk full of great benefits like water and chemical resistance, protection from stains, impacts, and heavy weight, and a bright, uniform appearance. While more costly than traditional paint, all of these coatings can last up to a decade and provide protection for your garage floor that can’t be beaten. Garage floor paints offer a uniform appearance that hides previous stains and flaws while protecting against new blemishes. These paints are scrubbable and offer wipe-off technology that makes almost any cleanup job a breeze. However, garage floor coatings are considerably more costly than garage floor paint. 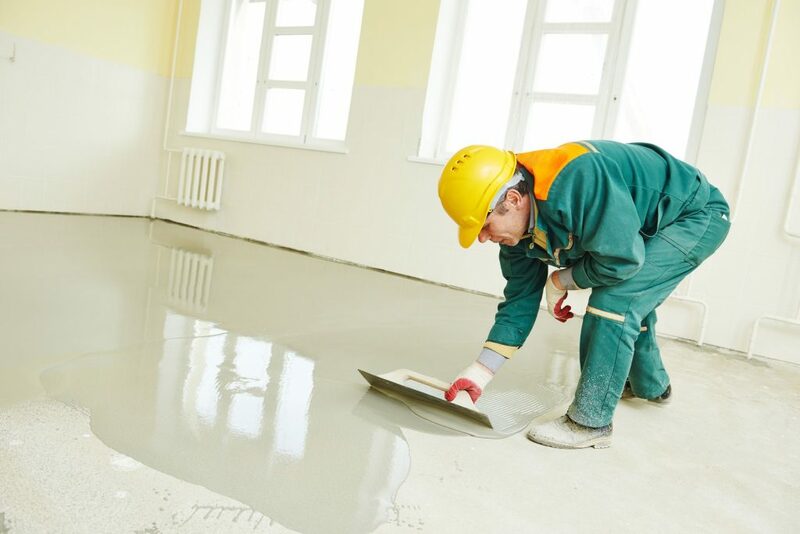 Before applying a coating, consider how much, and what type of protection your floor needs. Do you need protection from a considerable amount of mechanic work, or are you looking for defense against Johnny’s bike or Suzie’s tie-dye project? When the reinforced protection isn’t needed, a top-quality garage floor paint application will work just as well and be considerably less expensive. If you’re unsure of which product to use on your garage floor, or you want to ensure a flawless application, the first time, call the eSquared Asphalt Maintenance experts at 254-716-8685 to schedule an appointment. We will provide the guidance and expertise needed to ensure you get a garage floor you can be proud of. Abrasive Removal is Perfect for Removing Paint and Difficult to Scrape Gunk. It’s disheartening when a beautifully crafted surface becomes cluttered by paint spray, mold, and other gunk. If you’re luck, you can take the D.I.Y. approach; unfortunately that’s not an option for many homeowners and property developers. That’s where abrasive removal comes in. Here are three of the most common methods and how they might benefit your property. Bead blasting is a newer form of blasting that supplies many opportunities to tailor your own unique finish. It’s great for removing paint, rust, and other corrosive byproducts from surfaces. Particularly effective for wood, steel, and aluminum materials, beads can be customized to produce whatever gradient you desire. While less common nowadays, sand provides powerful and fast results for homeowners and developers that need results immediately. You’ll love the results: a lovely darker finish, free of paint smudges and any other smears. Sand blasting shouldn’t be used on softer materials that require gentler washing, but it works well with dense metals and other hard materials. That’s right! Walnut shelling is a natural, recyclable blasting material that’s perfect for removing gunk from more sensitive materials. If your property has wood or soft metal material that needs a gentler touch, walnut shells can easily clean them without leaving harmful scrapes and scarring. Afterwards, you’ll see a beautiful, smooth finish. More information about abrasive removal or other cleaning methods, feel free to speak to one of our courteous experts at eSquared Asphalt Maintenance. You can call our team at 254-716-8685. Posted in Uncategorized on March 29, 2019 at 8:29 am by eSquared Asphalt Maintenance. A Parking Lot Coating Protects Against Water Damages and Vehicle Friction to Extend its Life. What’s better than a brand new parking lot with a fresh coat of paint? Not much. This beautiful lot however, will face years of vehicle trauma and elemental corrosion. Not many parking lots endure that stress without cracking and allowing water leaks. Thankfully, you can extend the life of your parking lot and slow the degradation process. How so? Do it with special parking lot coatings. Benefit #1. It seals your lot from water leaks. One of the greatest sources of damage to your parking lot is the expansion of water inside your concrete. Coatings are especially valuable for protecting your lot during the winter, when water regularly expands and causes cracking. As a bonus, this sealant prevents much of the trash and debris that stumbles into your lot from sticking to the pavement. Who wouldn’t like spending less time cleaning up the parking lot? Benefit #2. Coatings reduce the stress caused by vehicle friction. 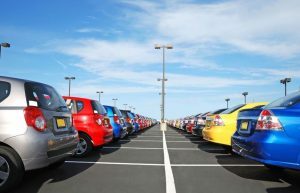 Consider the thousands of vehicles that come across your parking lot each year. This trauma causes your lot to fade quickly, but coating slows the fading and deterioration process. Benefit #3. Many owners forget about one of the most constant sources of parking lot corrosion: the sun. Solar radiation weakens the integrity of the pavement and causes it to crack. With a special coating, a much higher percentage of this radiation is deflected off the pavement. Less absorbed radiation equals less damage over time and a longer lasting parking lot for you. If you’d like to learn more about parking lot coatings in Waco and Temple, TX, you’re welcome to talk to one of our specialists at eSquared Asphalt Maintenance. Give us a call at254-716-8685. Posted in Uncategorized on March 13, 2019 at 9:58 am by eSquared Asphalt Maintenance. Construction is a huge mess most of the time. Unless you have a great crew that cleans up after themselves day in and day out, you will probably need to have your construction site cleaned up before you leave it. This is actually really important because it leaves the final impression to the company that you are building for. It is also a huge pain to have to do. Here are a few reasons you should consider outsourcing your clean up to another company. Time – Time is money and the more time you have, the more money you can make. We say this because once your crew gets done with a job, they want to move onto the next one as soon as possible, right? Don’t have them waste time and days cleaning up a construction site. Have it outsourced to someone so that you don’t have to worry about it and the burden is on someone else’s shoulder, someone who wants to do it for you! Done Right – When you have someone else do your construction site clean up, you know that it will be done right. And if for some reason you are not satisfied with the job, you can make that company come back and fix it. No money for labor time coming out of your pocket to pay your own workers, and you will be satisfied with the results every single time. With so many reason to hire an outside company to do your construction clean up, there is no reason why you shouldn’t give eSquared Asphalt Maintenance a call at 254-716-8685 right away. Should I Clean My Commercial Roof? If you are a commercial building owner, you know that commercial roofs can be very expensive. You also know that proper maintenance is an important part of keeping that roof in good condition. Today we will go over the various benefits of having your roof cleaned by our professionals! When Was The Last Time You Had Your Roof Cleaned? Have you noticed black streaks or areas of blackened growth on your rooftop? Those markings might be Gloeecapsa Magma, which is a common algae that can be particularly harmful to your roofing. The reason this algae is commonly found on roof systems is because it feeds off of the limestone available in your roofing materials, steadily gnawing away at them through time. This unsightly and damaging growth can be killed as well as removed with a complete roof cleaning. It’s essential to wash your roofing materials at the first sign of mildew or algae, as letting it grow as it pleases can lead to many damages. 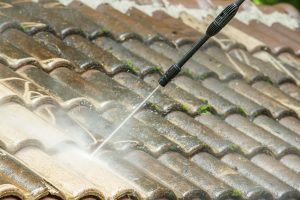 There are several different solutions we use to cleanse your roof, all of which are designed to gently remove fungus growth, as well as slow the growth of further mildew and algae in the future. 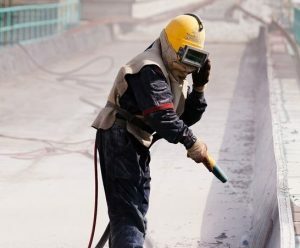 Though there are many techniques to help your company stand out among the competition, a clean rooftop can go a long way, especially for how budget-friendly it is. While we clean away algae, our pressure washer will additionally knock off any other debris like dirt, pollen, leaves, as well as grime. With our roof cleaning services, we can protect your roof investment swiftly, and at an affordable cost. We use high quality cleaning solutions that are meant to work swiftly as well as gently on your roofing materials. Pressure washing can be a great thing for exterior surfaces. It can get rid of seemingly impossible stains, making things look new. Of course, you need to know how to use a pressure washer effectively, first. Many people decide to rent a washer and use it, but pressure washing mistakes as a result are just as common. Some people assume the pressure washing is basically running a water hose over surfaces at a higher pressure. This is only a small part of it. It requires some skill and experience to handle a pressure washer properly, and safely. Pressure washers can be dangerous if misused; they can literally slice through things. Most DIY pressure washing problems start with too much pressure. It is easy to underestimate just how powerful these things can be. They can easily carve up softer things, like wood, and they can do serious damage to a person if not handled carefully. You have to learn proper settings, and the distances at which you should hold the nozzle. Many people also don’t realize that water alone isn’t always enough. You need cleaning solution in your mixture, and you need the right amount and type. If you don’t have that, you might not get the results you want, and that could lead to overusing the power. It is possible to learn how to use a pressure washer. It’s better, however, to get help. 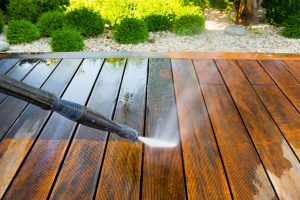 Avoid the common at-home pressure washing mistakes and hire us. Call eSquared Asphalt Maintenance for pressure washing in Dallas, TX. Call us at (817) 476-2355. Posted in Uncategorized on March 13, 2019 at 10:36 am by eSquared Asphalt Maintenance. Your parking lot is the first thing your patrons will see when y=they enter your business. They will decide right then whether they feel comfortable, welcome, and invited into your establishment. Don’t lose your customers before they’ve walked in the door- keep your parking lot neat, tidy, and in good working condition to improve the look of your entire property. Having your parking lot cleaned can dramatically improve the look of your space. It can get rid of stains, gum, and traffic sludge that has built up over time, revealing a fresh, bright surface that’s neat and inviting. Your parking lot is an epicenter for traffic and pedestrians. Don’t run the risk of having an accident on your hands from slippery build up or unclear lines. Parking lot pressure washing can cut through the buildup to revive your lines and markings and provide a non-slippery surface for your pedestrians. 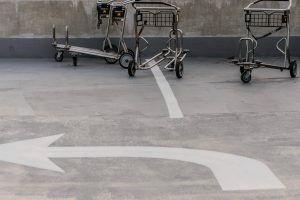 Regularly cleaning your parking lot will help clear it of trash and debris that can cause it to prematurely deteriorate leading to expensive repairs. This debris gets wedged into tiny cracks, expanding them and sometimes causing large cracks, potholes, or denting in your concrete or asphalt. Pressure washing your parking lot complete rids the surface of this debris and prevents deterioration. When you’re a business owner, you know the importance of making a great impression in every way possible. Don’t forget about the exterior of your building as well. For expert services that can prolong your parking lot’s life, call the experts of eSquared Asphalt Maintenance at 254-716-8685.